First an apology. I have not been blogging much lately, but I do have a reason, and I think a valid one for once (i.e. not along the lines of "I was out drinking last night" or "I was busy boiling potatoes" or something), I have been moving house. And my new office is now as tidy as ever (and if you believe that, let me tell you about a bridge in New York that I have for sale at a really good price). No, the place is a mess, but my beautiful wife keeps up with me, and I am slowly getting things together. That said, let's get to the point, MySQL Installer! If you read this blog, you know I have copmplained about this puppy several times before (First attempts with MySQL Installer and MySQL Installer part 2), and I have been in touch with the good developers at MySQL / Sun / Oracle / Google (no wait, that last one wasn't right. At least not yet) and for all intents and purposes, they are doing their best (I already knew that) and are listening to us. 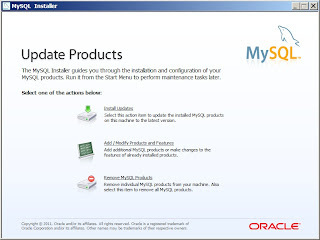 So now MySQL Installer is GA. Is it any better than when I complained last time? It sure is! Now it does what it was set out to do, it does install most of what you need as a MySQL Developer on Windows, it installs the MySQL Server, the Workbench and the drivers. This time around, I removed all Windows products first and then did a clean install, but some old settings still seemed to be around. This could be annoying potentiually, but the machine I was testing really has had a lot of testing on it, so it might be that this is in a weird state. Also, this might be what you want to do. Before doing a clean install, I tried an Upgrade. I had MySQL 5.5.14 on my box, and the installer came with MySQL 5.5.15, so I figured it would offer mne to upgrade if I choose Add/Modify Products and Features. 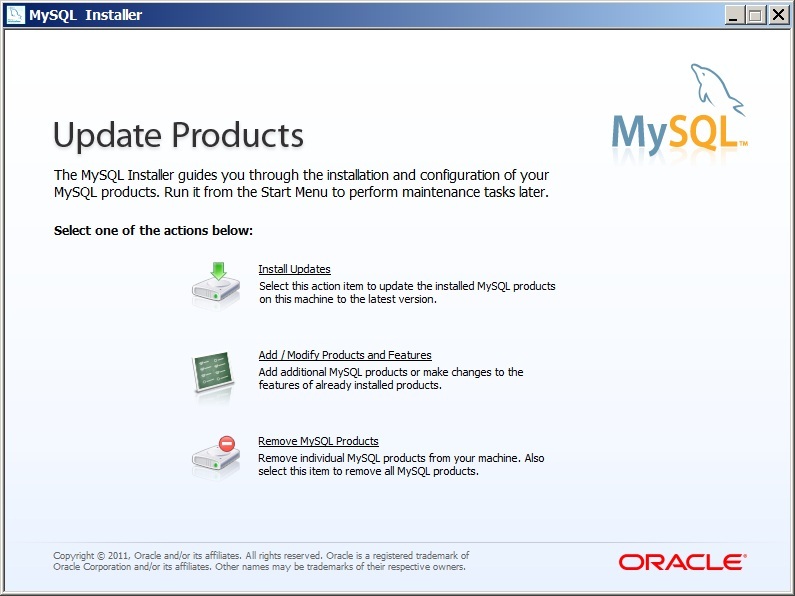 On the other hand, after a clean install, if I choose Add/Modify Products and Features again, the installer insist that there are "changes pending" to the MySQL .NET Connector. If I execute that it executes OK, but the Installer still insist that there are "changes pending" to Connector/.NET. Links - I'd offer in the installer too add a few links to useful places on the net for MySQL stuff. This includes Planet MySQL, MySQL Forge, dev.mysql.com, www.mysql.com, the Bug database (how active that is these days I don't know either). Third party software - There is some third party software that could be interesting to include, such as drivers (PHP etc), tools, plugins etc. There is a whole bunch of these available, and if I was new to MySQL, I would have a hard time selecting which to include and what to do with them. I understand the licensing issues here, but as this is the Community edition of MySQL, that shouldn't be too difficult. Tips and tricks - How do you do this or that? What questions might a Windows developer have when approaching MySQL for the first time. Integration - I would really like to see more integration here, with Visual Studio and with many other Windows developer tools. I admit that this might be there, but that the integration is hidden from me as I don't have those tools. These are just some ideas moving forward with MySQL Installer. The current product is a bit limited I think, but still useful and is now pretty stable. Why the MySQL Installer is not available on a swedish mirrow is beyond me, but that is a minor issue I think, unless you live in Sweden (like I do). For reference, I used 1.0.17 of MySQL Installer, something which is not that easy to find out, as the download page states that this is version 5.5.15 (which is the MySQL Server version). The installer itself doesn't say what version it is, at least not as far as I can find out. It does say in the VERSION resource of the MySQLInstaller.exe file though, so looking at properties with Windows Explorer reveals the version.